Good location and very nice staff. They upgraded our room to switch from 2 double beds to queen. The historic port city of New Orleans rests on the Mississippi River. The city offers a multicultural blend of European, African and Caribbean influences. Every year, visitors flock to the city to experience the sights, sounds and tastes of The Big Easy. From historic sites to unique festivals, the city offers attractions for families, couples and lone travelers. Located in the historic French Quarter, the lengthy street is famous for its nightlife, but there are attractions for all ages and interests. Many of the city's famous restaurants, historic landmarks and souvenir shops are located on Bourbon Street. Named after Andrew Jackson, the victor of the Battle of New Orleans, the beautiful public space offers a spectacular view of the Mississippi River. Jackson Square is also surrounded by local treasures, including the St. Louis Cathedral, museums, restaurants and markets. The square also serves as a creative space for artists, so visitors can obtain a one-of-a-kind painting from one of the many local painters. The Audubon Zoo is a uniquely beautiful wildlife experience in the heart of the New Orleans Garden District. The zoo features local exhibits and animals from around the world. The zoo also boasts a real swamp, a baby animal nursery, aquatic exhibits, a safari trail and more. At another site, the Audubon Butterfly Garden and Insectarium offers the largest insect museum in the country. The butterfly garden alone contains thousands of the lovely winged insects. The French Quarter is the city's oldest neighborhood. Residents and visitors alike are drawn to the neighborhood's convenient location, rich history and unique attractions. 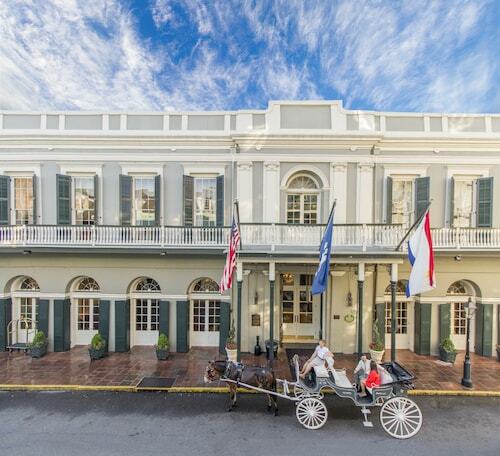 From luxurious mansions to charming boutiques, French Quarter hotels combine modern amenities and beautifully preserved architecture. The neighborhood contains the most popular hotels, restaurants and attractions in New Orleans. Bordering the French Quarter, this neighborhood contains the Convention Center, the Superdome and multiple business centers. Hotels in the Central Business District tend to be less expensive than hotels in the French Quarter, but French Quarter attractions are still within walking distance. Additionally, the Central Business District hosts several unique restaurants, shops and attractions. The Garden District offers a quieter New Orleans experience. The streets are lined with local shops, historic structures and gorgeous trees. You can reach the main attractions of the French District by streetcar, but the Garden District's local treasures and relaxed atmosphere are just as enticing. Like hotels in the Central Business District, Garden District accommodations tend to be less expensive than French Quarter hotels. The Louis Armstrong New Orleans International Airport (MSY) serves the city of New Orleans. Located in the suburb of Kenner, the airport is 11 miles from the downtown area. A shuttle offers transportation services from the airport to the Business District. New Orleans hotels in the area include the Hilton New Orleans Airport and the Doubletree New Orleans Airport. The New Orleans Union Passenger Terminal connects New Orleans to New York City, Chicago and Los Angeles. The facility serves Amtrak and the New Orleans Regional Transit Authority. Greyhound buses also utilize the terminal. Most visitors will flock to New Orleans between February and May to participate in Mardi Gras and the New Orleans Jazz and Heritage Festival. Both celebrations can be very exciting, but the city is typically crowded with visitors during that time. During this exciting time of year, some of the best hotels, restaurants and attractions have already been booked months in advance. Fortunately, the city hosts a full calendar of events. If you avoid the crowded city during Mardi Gras season, you can still enjoy authentic New Orleans cuisine, heritage tours, music festivals and more. If you're not accustomed to soaring temperatures and high humidity, the summer months can be unpleasantly stifling. Warm temperatures persist during the early fall months. However, if you can handle the heat, visiting New Orleans in the summer and fall can help you save money on accommodations. The winter and spring months are fairly mild, so the city is a very popular destination during the early months of the year. There was nothing I didn't like abut this hotel. Staff was awesome!!! The history and beauty of the hotel is amazing! Staff extremely friendly. Will definitely recommend you anyone visiting New Orleans. One very small con is the restaurant kitchen was backed up for breakfast during our visit.